I started out making pasta…. I was going to make pasta for dinner tonight. With a parmesan cream sauce. Using some of the garlic confit I made this morning. Then I thought, Um, since I used the recipe for the Confit from Michael Psilakis’ Cookbook , shouldn’t I actually use it in a recipe from his cookbook too?? Besides, I had chicken to use up. I looked up Garlic Confit in the index at the back of the cookbook, thinking it’d list all the recipes I could use the confit in. Nope. So I looked up Chicken instead. The Pan-Roasted Chicken with Lemon Potatoes looked good. I had the right ingredients on hand and – YIPEE – it uses the confit! You fry chicken, skin side down, flip it for a few minutes, flip it back and shove the pan in the oven. Meanwhile you boil potatoes, slice them, put them aside. Then you sauté some red peppers in a pan, add the potatoes, some lemon slices & oregano and cook until crispy. Unfortunately, the pan I *thought* was big enough for the potato concoction wasn’t. Quick thinking ensued: I put the chicken onto a baking sheet and shoved THAT into the oven. I used the big pan to cook the peppers & potatoes & lemons. Then you take the veg out, deglaze the pan by adding GARLIC CONFIT, lemon juice, water, salt & pepper and scraping the browned bits up. You taste the sauce and add more of whatever it needs. Veg back in, toss in sauce, lay out on a platter, top with chicken and serve! Well – the chicken splattered A LOT…. I mean a *LOT* a lot. A L.O.T. lot. I had to quick throw the kids outta the kitchen and barricade it so they couldn’t accidentally get burned by the splattering oil. Blech. Oh, and I totally followed the recipe and let the potatoes boil for 3-4min, until they were ‘crisp tender’ – which I took to mean they could easily be pierced with a knife. They needed to cook longer. C wouldn’t eat them. He did, however, ask me if the recipe was easy and when I can make it again. And – high praise – the BABIES ate it too. They don’t usually care for chicken, actually, J will eat most anything you put in front of him. R has become picky. The two of them split a chicken thigh and 3 potato slices. They refused to taste the pepper, which was fine with me because I really liked it. It was relatively quick and easy – minus the clean-up time. I think I’ll make this again. OH!! Before I forget, the garlic infused oil from the confit replaced all the regular oil I was supposed to use in the recipe. I couldn’t really taste an overly-garlicky presence to the meal, but it was really delicious. Yahooooooo! 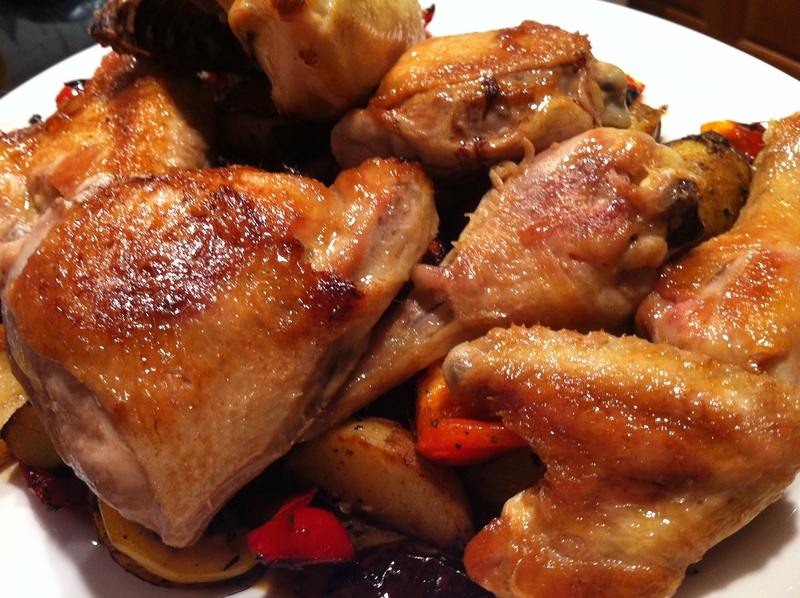 Pan Roasted Chicken with Lemon Potatoes by Michael Psilakis from How To Roast A Lamb. 1 Chicken, about 3 1/2 lbs, cut into pieces. Brine and Marinade – if using. Kosher chickens come brined, so I skipped this step. 1 lb. Fingerling Potatoes, scrubbed **I think I used large potatoes cut into small pieces. 1-2 teaspoons oil **I used Garlic Confit Oil, but use what you have on hand. Psilakis recommends a mix of 90% Canola and 10% Olive oils. 3 Red Bell Peppers, cored, seeded and thickly sliced. 1 teaspoon dry Oregano, Greek is preferred, naturally! 1- If using Brine – brine your chicken overnight then rinse with cool water and pat dry. If not, go straight to the Marinating bit. 2- Marinate your meat: Combine all the marinade ingredients (I did this in a large ziploc. Feel free to use anything with a lid or that you can cover in plastic wrap). Add the chicken pieces and seal. Let marinate at least 4 hours or overnight – depending on your time frame/patience…. 3- Bring the chicken to room temperature. Meanwhile, put the potatoes into a small pot of liberally salted cold water and bring to a boil. Simmer until crisp-tender, about 3 to 4 minutes. Drain well and slice 1/2 inch thick. Reserve. 4- Preheat the oven to 375°F. Lift the chicken pieces from the marinade, allowing the liquid to drain away. Season the skin with a little kosher salt and pepper. In a 12-inch ovenproof skillet, heat a thin film of blended oil over high heat. When the pan is very hot, add the chicken halves skin-side down and don’t move them at all until you get a nice golden sear, about 3 to 4 minutes. Turn over and cook for 2 minutes more. Spoon off some of the fat and turn the chicken pieces skin-side down once again. Transfer the pan to the oven and cook for 15 minutes. 5- Meanwhile, in a second pan, heat a thin film of extra-virgin olive oil. Add the peppers and sauté until softened. Add the potatoes, lemon slices, and oregano and continue to sauté until golden brown. 6- Transfer the chicken to absorbent paper, on a platter, skin-side up. Keep warm, uncovered, in the turned-off oven. Discard most of the fat from the skillet and place over medium-high heat. Deglaze the pan with the lemon juice and water. Stir in the Garlic Purée or butter/Margarine and lemon slices and remove from the heat. Season with salt and pepper. Transfer the vegetables and pan juices to a large platter and place the chicken on top. Drizzle with a little olive oil and scatter with the fresh herbs. After you’re done wiping down the splatters, you can start clapping. Loudly. I haven’t made chicken wings in awhile, this looks delicious!